During his time at The Bridge School, Collin was a motivated and hard-working student with a big imagination and great ideas to share with his classmates. In order to expand his social and academic skills, he worked diligently with his teachers and speech pathologists to develop and refine his communication tools and strategies as well as his seating and positioning. This significantly maximized his ability to access his communication device and classroom curriculum/materials so that he could focus and participate fully in all activities during the school day. Collin was able to advocate for himself and increase his participation by directing partners, asking questions, requesting assistance, sharing opinions and information and taking a leadership role in classroom activities. Collin introduced and announced all classroom events to classmates, families and guests, including Author’s Chair, Open House and special holiday. Collin also performed in several theatrical productions with his classmates at the adjoining middle school. Collin was interested in developing more ways to express his opinions and actively plan events with his family, friends, classmates and teachers. During the Self-Determination Program, Collin worked with his classroom team to develop a goal with the objective being his increased participation in planning activities both inside and outside the classroom. Collin was instrumental in planning the Self-Determination Program end-of-the-year party, which included a presentation to parents and other guests. 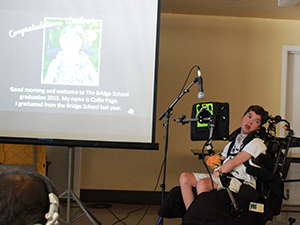 Collin also took a lead role in organizing and planning The Bridge School graduation celebration, including designing invitations and determining the menu and thematic decorations. 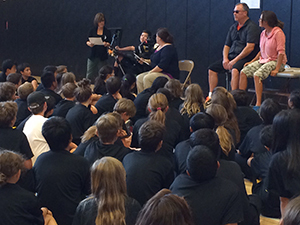 After transitioning from The Bridge School into his local middle school, Collin continued furthering his public speaking skills and made multiple presentations to new middle school classmates and staff regarding his specific communication tools and strategies. In addition he was the keynote speaker at The Bridge School’s 2015 graduation celebration and shared words of wisdom as well as recent experiences and accomplishments with the new graduates.